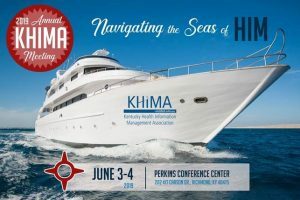 The Kentucky Health Information Management Association (KHIMA) Board of Directors are pleased to announce plans for the 2019 Annual Meeting to be held June 3rd and 4th, 2019 , in Richmond, KY. This year, our theme is Navigating the Seas of HIM. Health Information Management (HIM) professionals have weathered many storms over the past several years, including MIPS, MACRA, value based purchasing and healthcare reform just to name a few. When the seas finally calm, new storms approach. HIM professionals must grow and nurture their skills to be ready to weather the storms of heath care. We hope you will join us as we come together to learn from experts and one another, about how to navigate the ever changing seas of HIM.